Quickly view key performance statistics such as CPU(multi-core layout), Memory and Swap usage Details. Scroll the process list vertically and horizontally to see all processes and complete command lines. Kill processes by selection rather than entering process number, use mouse to select list items. PuTTY (the Telnet and SSH client) can be used for the interface at client. 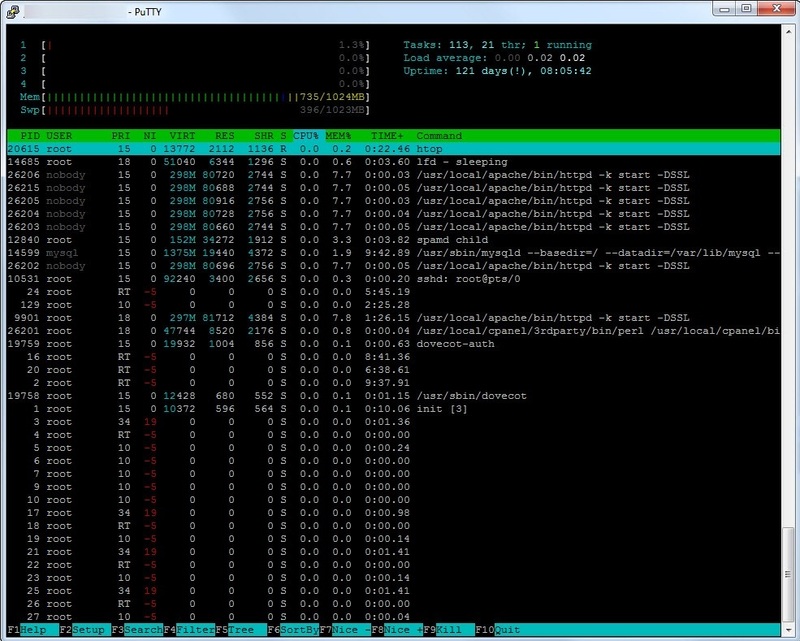 Now run the following command at command prompt or in PuTTy to start htop processes viewer. After the installation of Htop, you can view the manual and other utilities of Htop, with the following commands. [qasim@server ]# man htop To view manual of htop, having complete details. [qasim@server ]#htop -h To view different options/plug-ins. [qasim@server ]#htop -u username To view the active user’s currently running processes information. [qasim@server ]#htop -u qasim To view the qasim’s currently running processes information.